﻿ Demos | Just Cooking | Kerry's premier and much loved Cookery school in Firies. A fantastic way to entertain a crowd. Creating an atmosphere and sense of excitement at any event can be a challenge, and while you are busy trying to make sure your event runs smoothly wouldn't it be great to hand over the job of creating excitement and entertaining your guests to a professional? 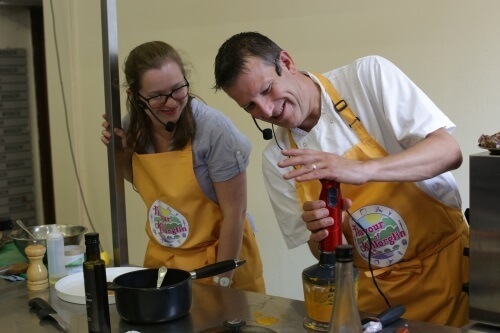 Just Cooking cookery demonstrations are a fantastic way to entertain a crowd at fund raisers, launches, fashion shows and many more corporate events. Professional chefs, like Mark Doe of Just Cooking, are used to working under pressure and being in the lime light! Mark can cater for any crowd and create a demonstration to excite and engage your clientele setting them up for a great night of food and socializing whatever the occasion may be. We can even offer a cookery demonstration with a tasting of the dishes cooked by Mark to really impress the crowd. Some of the clients Just Cooking have catered for in this way are Lee Strand, The National Dairy Council, Waterford Stanley various GAA clubs and schools, all who have all been extremely impressed with what the cookery demonstration brought to their event. So for an alternative form of entertainment that will bring a level of sophistication and edge to your event please contact us.